No more switching between different windows to type and edit your transcriptions. 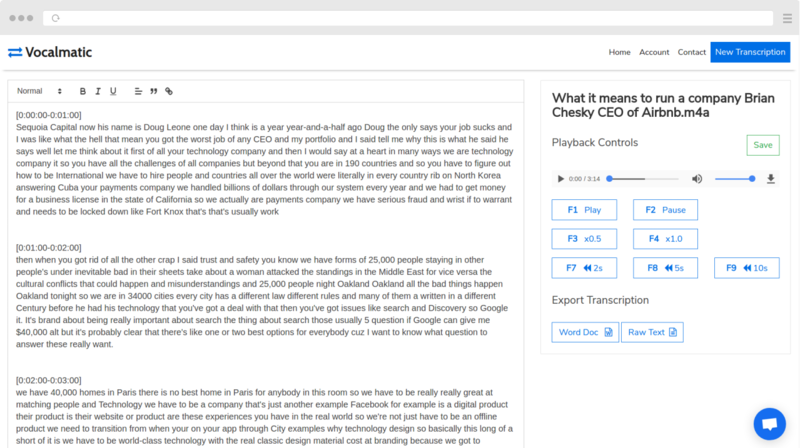 With Vocalmatic, you get both the text and audio player on one page. Vocalmatic's Speech-to-Text technology is powered by the same ones at the big technology companies. So, you can count on our automatic transcription technology to be bleeding edge! We support automatic transcription of over 100 languages and varations. English? French? Spanish? Swahili? No problem. Upload your media content to our secure servers. (Accepted Filetypes are mp3, m4a, mp4, flac, ogg, wav, aac, opus, oga, mogg, webm, wma). Vocalmatic will convert your audio to text using A.I. Choose from 110+ languages and variations to transcribe your audio files into. Finally, once your automatic transcription has completed, we'll email you a link to your text where you can edit! As the name implies, Automatic Transcription is the process of computers 'listening' to audio recordings and returning an automatically generated transcript of what the computer 'heard'. It's very similar to what humans do when transcribing, but of course the difference is that it's a computer doing the transcription. To make this possible, automatic transcription software like Vocalmatic are powered by Speech-to-Text Technology. It works by analyzing an audio recording second-by-second, determining what word is said at each second, and saving each word into a transcript of the audio recording. Once completed, a collection of words that the machine understood will be returned. What are the Benefits of Automatic Transcription? The biggest benefit of using Vocalmatic is that you can really cut down on the time it takes to transcribe an audio file into text. You'll be able to skip over the part where you sit down to listen and type out what you hear. Instead, you can use Vocalmatic to first turn your audio file into text, then you can go in an edit it to your liking.